1. Spoon 1 tbsp of the caramel into the bases of 6 small glasses. 2. Melt both chocolates together in a bowl over gently simmering water. Remove from the heat and cool slightly before stirring in the soft cheese. 3. Using an electric whisk or stand-alone mixer, whip the egg whites with the golden caster sugar until stiff peaks form. Add the vanilla powder before folding into the chocolate mixture. 4. Spoon the mixture into the glasses and chill. 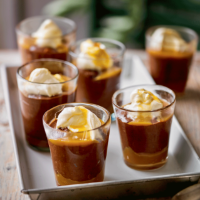 When ready to serve, top each pot with a dollop of whipped cream and a drizzle of extra caramel. Egg warning: recipes containing raw or semi-cooked egg are not suitable for pregnant women, elderly people, or those with weak immune systems. For information on nutrition and health, visit waitrose.com/nutrition.